With Saturday’s lone meeting of the regular season between the Revolution and Dynamo, let’s dive studs up into this week’s set of questions. 1. 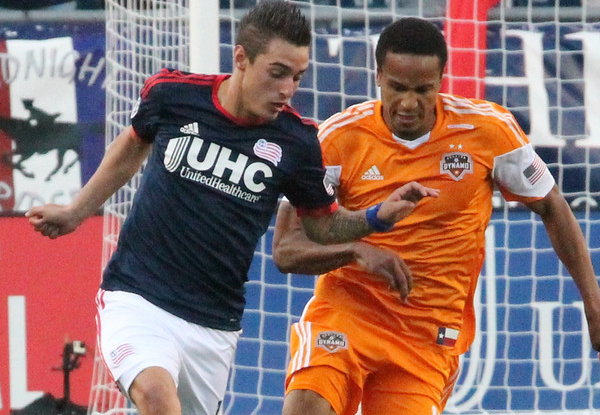 Will Kelyn Rowe be back in the XI? Based on his last 110 minutes of action, the answer appears to be a firm ‘yes.’ Since coming off the bench late in Chicago, the fourth-year midfielder’s scored, assisted, and drawn a penalty for good measure. In other words, he’s doing a lot of things right after struggling to find his form earlier this summer. In light of that, the chances of seeing no. 11 on the wing come 7:30pm(ish) on Saturday is very high. 2. Does Jeremy Hall hold onto the starting right back’s spot for a fourth straight week? It certainly seems like he will. After riding the pine for much of the season, the converted fullback has stepped up and ripped the spot away from the once-promising London Woodberry. The former Toronto FC midfielder isn’t flashy, nor is he much of a threat going forward. Heck, there are times in which it seems the offense willingly casts him as an afterthought when advancing the ball. Nevertheless, Hall does something that Woodberry hasn’t done nearly enough this summer: he limits his mistakes. Sometimes, that’s all it comes down to when a spot in the XI is up for grabs. 3. How long will Jermaine Jones play? The prized midfielder was asked that very question on Tuesday, and he estimated 60 minutes. That not long after, Heaps was posed the same query, he gave a range of between 30 to 60 to 90 minutes. To the best of our knowledge, the Jay Heaps bobblehead was not asked for comment, but then again, bobbleheads don’t talk. They just nod in agreement. To everything. Anywho, given that Jones and his teammates had an additional week of rest thanks to the bye, we’ll take a shot and say he goes 75 minutes before exiting for Daigo Kobayashi. 4. Can the defense keep Will Bruin and Giles Barnes off the board? The answer to this one partly depends upon whether Hall can continue to avoid the game-changing gaffe. Barnes has given pure defenders plenty of nightmares this season, so you can imagine the potential terror that awaits a fullback-but-not-really-a-fullback. Ditto for Bruin, who appears to be hitting his stride as the Dynamo have started to put together results. Yes, the Revolution can keep the Dynamo duo off the board, but it may take a couple of MLS Team of the Week-worthy performances in the rear to do so. 5. Is the offense poised for another strong performance? If you’re starting to get the vibe that we’re in 2014 all over again, it’s probably not just because of the Revolution’s recently-snapped summertime slide (knock on wood). Or the stadium rumors (yeah, those again). After struggling to score for much of the season, Lee Nguyen has hit his stride by tallying in each of his last three. Then, there’s Charlie Davies, who just bagged his first regular season brace for the locals two weeks ago. Although the Dynamo aren’t terrible on the road this year, they’ll be facing a squad that’s fresh off a long-awaited bye week, and by all accounts, hungry to poke holes through an opposing backline.